The problem with sequels is that they're rarely as good as the original, any show that actually achieves the feat of surpassing the original appears only once in a blue moon. Given that fact, I will freely admit that I approached Aria: the Natural with a certain degree of trepidation, especially as the original series is a favourite of mine. Thankfully, all of my fears were removed in the gentlest manner possible. Aria: the Natural continues the tale of Neo Venezia in very much the same manner as the original, except for the fact that this series is twice as long. The story, once more, revolves around Akari, Aika and Alice as they go through their daily lives in their "quest" to become undines. The episodic format of the original series is maintained throughout this one, and the show generally manages to achieve the same relaxed feeling of the original. However, Aria: The Natural has some moments that purists would define as "off-kilter" - a view I tend to disagree with. Let me explain. 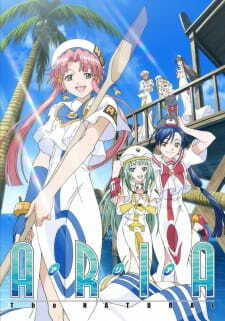 The first series was very much an introductory show, allowing the audience to familiarise themselves with Akari, Aika and Alice, as well as the other residents of Neo Venezia. The Natural, on the other hand, is an introduction to the world of Aqua itself, something which was alluded to in the final episode of the first series. Indeed, the role of cats in this series is much greater than before, and the quasi-supernatural element of the show, which was only lightly touched upon previously, is very much in force here. Because of this though, many people view The Natural as inferior to the original series, basing such judgement solely on the fact that this show has some genuinely creepy moments, as well as the fact that several episodes are based purely on supernatural events. In Aria: The Animation, the effect of the supernatural was toned down to maintain the relaxed feeling of the show, however The Natural pushes this aspect of Aqua firmly to the fore with the introduction of several elements - Cait Sith being the primary one. Art and animation for The Natural remains as superlative as the original, with some improvement given to some of the more "fantastic" plot elements. Character designs remain unchanged though (which will come as a relief to many fans), with each of the leads and the supporting roles being as visually charming as ever - even in Super Deformed mode. The panoramic views of the Neo Venezia remain very much in force, however these have been enhanced more because of the attention given to other areas of Aqua. The level of detail is actually better in The Natural because of the show's focus on the world of Aqua, and with that attention to detail comes a degree of personality (yes, I know it sounds weird saying that a world has personality - watch the show and see for yourself). Sound and music continue to be excellent, with the voice actors doing sterling work with their respective characters. The thematic music used throughout the series is very much in keeping with the style of the original series, and retains the same "continental" feeling as well. The sound effects are again, excellent and well choreographed, with nothing too overwhelming or too subtle. The OP and ED are calm and melodic, keeping the fluidly relaxed theme of both the original and this series. The characters are, again, a joy to watch, however some people may not follow this train of thought because of the supposed "flaws" in the show (i.e. the supernatural elements I mentioned earlier). Akari, Aika and Alice continue to be as charming and as innocent as ever, and while there may be a distinct lack of major development in this series, I didn't find this factor to hinder my appreciation of the characters in any way. The supporting characters continue to be by turns witty, soothing, stern, downright hilarious, etc, very much in keeping with the original series. However, many of the supporting cast tend to take more of a back seat in this series, with a greater amount of focus being given to Akari especially. Fans of the original series may not find that The Natural sits too well with them, especially given the fact that this show is less about the characters and more about the world they live in. That said, it continues to be a truly enjoyable series overall, and a truly relaxing one at that. Aria: The Natural, whilst maintaining everything that made the original series great, is actually a very different show, and I would judge it at least equal to The Animation in every aspect. Given the basis of The Natural, and its intorductory perspective on the world of Aqua, it's no surprise that fans recommend watching both series before watching Aria: The Origination. Story: The reason why the plot is so good is that each episode has a unique story and it never gets tiring despite not having a running story. Neo-Venezia is a place meant to be explored and that is what we get thorugh the series as Akari and Co. meat new people and grow. Watching something like this is relaxig and just puts a smile on your face. Animation: The world of Aria is absolutely beautiful. The town of Neo-Venezia is presented in such detail that it makes me wish that I was there. And the sceneries are a sight to see and in an anime like Aria, we get to see them in many aspects, whether it is in the morning, evening, night etc. The only thing i wish for is a HD version of Aria, but still gets full marks none the less. Character: This is perhaps the best aspect of Aria. Each character is not only unique but is extremely likable. There is a wide range of personalities yet they go so well together. And their chibi face form is hilarious. Each have there own style and goes well with their personality. Overall, to me, not only is this the best slice of life, it is the best anime out there. It is just perfect. While this type of anime is not for everyone, Aria the Natural was everything i could ask for. Hopefully you can see the magic of Aria like I did if you ever check this out and become a fan too. One expression: "Embodiment of relaxing happiness". Welcome back to yet another season of Aria. Never heard of this anime before? To put it bluntly: this whole series marks the pinnacle of entrancing anime Slice of Life. To follow the anime chronologically, please watch "Natural" only after you’ve finished "Animation", otherwise you might miss out on proper character and world introduction. Note: Alongside the actual review you will come across some diary entries written by our protagonist Akari in her usual cheerful way. Let them accompany you during your personal gondola travel throughout Neo Venezia as you read this humble examination. "Dear Diary, how have you been so far? since I experienced a WORLD last season. the colonization of Mars had a bountiful reason. and it isn't only to make this rhyme! and relishing the friendly people, the slower pace. This life is more natural than your dearest dreams." what can I do against this moony state? Maybe we've overdone the star-gazing a bit. and dreamed of a yummy banana split. our beloved Aqua below its top surface. or how to spend the most memorable hours. Together we preserve the peace in grace." Every remarkable anime needs an interesting and unforgettable cast of characters, and Aria definitely delivers. The plot focuses on three apprentice undines (undine is an equivalent of gondola tour guide) and their respective masters (widely known as the "Three Water Fairies"), belonging to three competing companies. Yes, although they're competitors on paper, you forget that this is Aria, so they train and even celebrate together, not letting any hostile thoughts build up during the entire show. The tendency for names to begin with "A" is quite obvious, and one might think that this will result in challenges distinguishing them from one another. Fortunately, these difficulties are immediately scotched because of diversified traits all of these young women have, both in appearance and manner of speaking. One's for certain: You will never forget their key expressions and special faces, so what else would you need for characters to become memorable? are by far the best method to maintain my inner peace. "Embarrassing remarks aren't allowed!"... Ehhhhhhhhhhhhhh? of me during my adventures, in every case. Dear Ai-chan is mailing with me everyday. that any letter can overcome time and space." Concerning the other inhabitants of Neo Venezia, a special mention has to be given to the cats. Not only do they provide even more heart-warming moments by constantly being around as "presidents" of their respective company, but they also maintain certain traditions to add to the mystery aspect of the world. Being Slice of Life, it's only natural for our undines to interact with all kinds of people during their daily work. Everyone tells their own story and fits perfectly into the whole setting. As soon as the viewer identifies themselves with the general mood, watching the characters is an utmost bliss. As trivial as some of the stories may seem, they all carry a deeper meaning, and overall, help to eternally carve the world of Aqua into one's memory. we met Akatsuki-san gathering roses for Boccolo day. He wants to see Alicia go "ara ara" again. connected to San Michele Island more or less. Yep, so much unfathomable wisdom there is to gain. Have you ever heard of Redentore before? The Wedding to the Sea or the golden oar? Maybe I should ask wise Grandma about all of them. with mystic Cait Sith improving their conditions. Another detail in this as our world carved aquamarine gem." Even if it's episodic, Aria's ability to tell profound and humane stories is virtually unmatched, especially concerning the Slice of Life genre. "Aria the Natural" succeeds both in surpassing its prequel through the sheer power of empathy and the preservation of its initial premise, yet always being special every episode. Admittedly, the style of the story telling may appear boring to anyone not accustomed to this kind of anime. Watching more than two episodes per day is not recommended, otherwise it will really be too much/too less for the viewer to consume. Neo Venezia and Aqua are generally places that should be frequented in short visits instead of long ones in order to completely admire their wonderful beauty. you even could see Hope Hill from there. I need to console and for whom I must care. Oh, this place's life is certainly unique. with them a lot about the city's style. and let us sense a light sea breeze awhile." Natural’s art and animation unquestionably serve their purpose. The architecture of Neo Venezia with its detailed Italian touch and generally colourful drawing style make the town's visit aesthetically pleasing to the eyes. Being Aria, the overall manner of art isn't flashy but rather quaint, although special moments with spectacular light effects or noticeable water reflections aren't left out either. on discovering another unique Venezia touch. and feeling Makino Yui on San Marco Square rejoice. Music assists and quiets me down before advancing. while bearing the sun looking like a giant toffee. I hope the heat won't cause any illusion. music-less this world would fall into seclusion." Music-wise the general mood stays the same as in every other category: calm and relaxing, but always soulful. Smooth tones brought to our ears by plucked instruments with occasional mystical chants and lyrical insert songs. One aspect in which "Aria the Natural" surpasses other anime is the everlasting vigour of the opening with its song "Euforia" performed by Yui Makino. I'm not exaggerating: This opening is the only one in all anime that I haven’t ever skipped; the impact is simply amazing. The seiyuus perform their assigned roles splendidly, and because of the previously mentioned main characters' impressionable manner of speaking, they have a high chance of staying in the viewer’s mind. which gently heal our hearts, our soul, our bones. as Prima Undine I need more special traits I love. I reached this goal, without caring for a penny. town's kindness reach the hearts of many'." A picture is worth a thousand words, as the old proverb says. If you're already familiar with the prequel "Animation", this sequel includes everything required to top your previous experience. To everyone who's new to Aria: This review is coming to an end, but your journey has just started and I hope that you have the necessary tools now to decide whether or not to give this outstanding anime a chance. Not to mention that its sequel "Aria the Origination" finishes the whole series in one of the most emotional ways I've ever encountered in anime or any other medium before. Aria had captured my heart in no time... so why not yours too? It's strange to think about everything that has gone on in one's life to get to this specific moment. The people one has seen, the events one has experienced, and the magical moments one has witnessed all culminate into a single, solitary point in time. These various encounters seem miniscule and largely unrelated. But if one looks at the bigger picture, it's easy to see that these tiny dots form quite the beautiful image. Such is the case with Aria the Natural and most of what it has to offer. Aria the Natural begins where its previous season, Aria the Animation, left off. Akari, Aika, and Alice are still aspiring Undines, experiencing everything that Neo-Venezia, Aqua, and life throws their way. Aria the Natural follows quite well in its predecessor's wake. Calmness oozes from every corner of the show, and the girls' escapades are mostly aimed at teaching and learning lessons that someone needs in order to become a well-rounded person. However, the mood actually deviates from this path on a semi-regular basis. It takes on creepy scenarios that test Akari's resolve, romantic scenes that expand Aika's emotions, and angry situations that reflect Alice's inner turmoil. Now, the changes in mood are not grand; they're as small as a gondola's displacement while rocking silently on the sea. But being able to see the show literally leave its comfort zone provided it with both interesting and unique outlooks. These outlooks aren't just standalone, though. The themes are, once again, quite general and applicable to most people. Meaning there is a lost sense of worth attached to many of them. Individually, these themes are simple, but hearkening back to the introduction, it's the entire scope that matters. For Aria the Natural, it kicks off with the idea of "encounters" and never lets up. Without fail, each episode binds its personal message with this over-arching motif. For countless examples: it's best not knowing everything in order to encounter new things, some encounters are better left alone, an encounter may last a lifetime or not at all, particular encounters can happen vicariously, etc. What it does incredibly well is getting across the notion that encounters are indescribable. There are so many variations, so many definitions, that it just isn't possible to sum up succinctly what one encounter entails. In Akari's words, an encounter is simply "wonderful." It's best to think of Aria the Natural's themes as one of the buildings that populates Neo-Venezia. The foundation and pillars are the general ideas presented. While alone they just "sit" there, they fully support the roof, or overall theme, that rests atop them. And what one is left with is a structure that, no matter the season, remains steadfast and strong. Aria the Natual also continues the tradition of placing heavy emphasis on the world of Aqua. The exploration of the underground, information on Pair graduation, and the Redentore Festival are apt instances that further promote how rich and detailed the environment really is. And just like the mood and themes before it, Aria the Natural goes above and beyond once more by providing better balance. Aqua and Neo-Venezia remain a focal point, but more attention is given to the cast -- both main and side -- and to the fantastical nature of the setting itself. Going into the intricacies, the story still follows Akari, but actually gives the other characters a chance to "strut their stuff." Aika and Alice get their own tales, and some of the side characters -- such as the mailman, Akatsuki, and even the townspeople -- get their own chance in the spotlight, providing the show with even more diversity. At the same time, Aria the Natural incorporates more of the supernatural. That is, among the realistic adventures being had are the dream-like ones. The "fox's wedding," the looping canal, and the appearance of the spirit of the gondola boosts both the city's and the show's feeling of being otherworldly, something that is constantly alluded to. In short, by spreading out the story, and not strictly revolving it around Akari, this newfound balance elevates the anime that much further. Aria the Natural, as already discussed, loves to talk about its world. And if there is anything that it does more than describe it is show it to the audience. Once again, the art captivates: the beautiful scenery on the oceanfront, the Venetian statues and towers, the plazas and alleys; at this point, it feels less like the Italian version and more like the Aquan. On top of all this, the comedic faces for the whole gang are also back in full-force. The character designs, likewise, maintain their past-yet-future look. The girls, at certain points, do don more domestic drab, which was a nice change of pace. There are two notable occurrences of vastly different style changes, however. The lesser of the two is during the filler story, where the cast has their gender's swapped. The goal of making it seem unsettling worked, due in part to everyone's uncharacteristic male and female looks. The greater, and obviously most important, is Aika's hair. This will be talked about further ahead. The animation sees a bit of an increase this time around, if only because of the length of the season and because of the actions the characters take. In other words, Akari, Aika, and Alice do a lot more this time around besides sitting and standing. Walking, running, and jumping happen regularly, since the peaceful nature of the show is shaken up every now and again. The cast of Aria the Natural begin to shed their one-dimensional status and actually see some proper development over the course of the season. As the youngest of the trio, Alice actually comes off as the most mature. Her stoic demeanor and often quiet way of speaking makes her seem older than she is. While she is most often perceived as an adult, the struggles she faces are entirely childlike in nature. For Alice, she has extreme difficulty establishing relationships with other people. And this is a two-way street: it's giving and receiving the connections. Having the courage to socialize with others and understanding that not everything can be handled alone allowed her to grow into the person she always came off as being. Aika's problem was somewhat different, but still two-fold. As is often evident, she is quite outgoing when it comes to speaking and letting Akari and the gang know how she is feeling. But interestingly, while she uses her emotions, she did not fully comprehend what they entailed. That is, she wasn't able to understand herself. In the game of love, her feelings remained repressed because of her uncharacteristic lack of confidence. But a nighttime meteor shower, a few hair-clips, and a man named Al provided the self-esteem boost she required to see that her genuine love is nothing to be unabashed about. And Aika sees even further improvement in regards to herself. She had always wanted to be Alicia; copy her elegance, mannerisms, and beauty as best as she could. But following an unfortunate accident, she learns an incredibly powerful lesson; that one shouldn't try to replicate anyone else but one's self. It sounds cheesy, but it's true. You are your own person, and that means that the experiences, emotions, and events you encounter cannot be emulated again. Everyone is special, is unique, in their own way, and Aika discovers this in a somber yet heartfelt manner. And though the symbolism of cutting one's hair is common, it fits here perfectly; she transitioned from someone "unknown" to her and into the person that not Akira, not Akari, and even not Alicia could be: herself. Not to be outdone in development, Akari goes more philosophical. Known for her unending kindness and unparalleled optimism, this season tests her beliefs. What does this mean? Once again, there are two sides to investigate: facing both the real and the unreal. For the first time, Akari undergoes situations that aren't "pretty." She senses fear, trepidation, anxiety, longing, seriousness; complete opposites to the personality that she normally boasts. This made her more human, more real, than she has ever been before. But ironically, it's the fake that reaffirms her that the world isn't just filled with these more degenerate feelings. Before, Akari's love toward the city was prominent. Now, it's the city's love toward Akari -- in the form of Cait Sith -- that takes center stage. It protects and guides her, letting her know full well that, despite the hardships that life may contain, her way of thinking and acting is something truly precious. For each girl -- Akari, Aika, and Alice -- they're development can be summarized as maturing. And each goes about it in different ways: Alice becomes an adult, Aika finds herself, and Akari is grounded to reality. This would not have been possible without the helping hand of their respective mentors, namely Alicia, Akira, and Athena. Besides merely complementing the girls, this season sees them being teachers not in the art of the Undine, but in this aforementioned maturity. Athena pushes and grabs Alice at just the right moments; Akira is the unyielding rock that forces Aika's hand; and Alicia acts as a mother, giving Akari the wisdom that only years of life experience could match. Now more than ever, the Three Great Water Fairies are more than just the greatest Primas of their age. They're symbolic gondolas, guiding their apprentices down the canal known as life. The OP follows in the character designs' footsteps. That is, it embodies both an out-of-reach yet close vibe that makes one at ease whenever it is heard. The beautiful vocals, water-like sound effect, and simple beat in conjunction with the piano and violins really do make the piece euphoric. The ED lends itself well to avoiding the use of lyrics. The plain guitar, piano, and violin work together in a catchy manner, while simultaneously soothing the atmosphere. The piece isn't stellar like the OP or other parts of the OST, but it fits well enough. The soundtrack is, once again, great. Like the ED, the dainty guitar, the soft piano, and varying violin playing meld as one, capturing not only the simple life, but one that fits Neo-Venezia to a tee. Especially so is the track with the slow-and-fast guitar-playing combined with various instruments. It's rising and falling notes create a piece that can be happy or sad to fit whatever situation needed. An issue that persists into this season, though, is the use of lyric-heavy tracks. During certain segments, the soundtrack uses pieces that are filled with vocals. The lyrics themselves are fine, but their use distracts the viewer and lessens the impact of those particular scenes. Voice-acting is above-average across the board. Ryou Hirohashi as Alice with her no-tone way of talking, Junko Minagawa as Akira with her stern yet soft voice, and Chiwa Saito as Aika with her girly and funny way of speaking perform wonderfully. And this applies to every woman involved, too; all-around great job. What I always found fascinating was the show's ability to use the same tactics to get a laugh out of me. The first season did this as well, but it still never feels repetitive. In fact, it was a game for me, trying to correctly guess when Aika would shout her famous phrase or when Alicia would softly say those two small words. Alice's "fish-face," combined with the sparkle, always made me smile, as did everyone's minimalist expressions. Also, that meat dance at the barbecue was not only out of nowhere, but pretty hilarious, too. This season also got to me a few times. Not crying, but getting that lump in the throat and the watery eyes. Specifically, it was the student's letter, the "nightshine" chime, and the gondola. Each dealt with saying goodbye, and each time it emotionally resonated with me. Which is really intriguing; they're "just" inanimate objects, but the set-ups, the characters, and the mood made those moments stand out. As a sequel, Aria the Natural improves in many key areas. The story finds more overall worth and the characters become more than just placeholders. Combined with small tweaks to sound and animation, its nearly done all that it can. With one season left, hopefully Akari, Aika, and Alice are given the proper sendoff that this season demonstrated that they deserve.